Speaking of blueberries… while at Maplewood Bog earlier this week I discovered these flowers growing in the forest. It’s one of those species that you recognize right away when you see it, because it’s so distinctive. 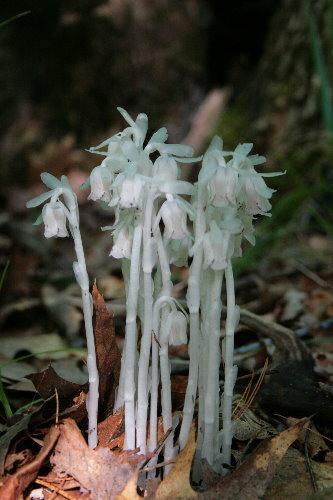 They are Indian Pipe, Monotropa uniflora, also known as Ghost Plant or Corpse Plant for its pale, almost ghostly appearance, and are completely white because they lack any chlorophyll for photosynthesis. What you see growing above the ground is all there is to the plant – there are no leaves, just these flower stalks. It tends to grow in areas that don’t receive much sunlight, primarily dense forests, and chlorophyll would end up costing the plant more energy to produce there than it would be able to get back through photosynthesis. So where does it get its energy, if it isn’t producing it itself? There are a number of non-photosynthetic plant species, and most of them are parasitic on another. One of the best known, perhaps, is the mistletoe of western North America, which hangs in the branches of its host tree in large clumps. 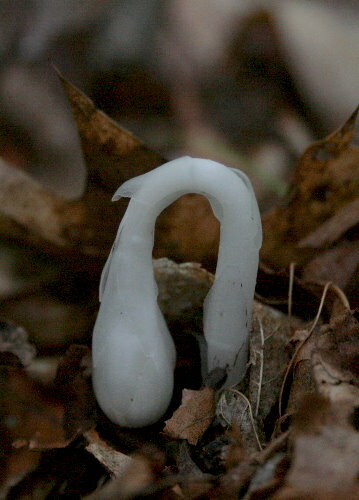 Indian Pipe appears to be independent, but its host is actually hidden underground. It parasitizes a mychorrizal fungus, which itself is symbiotic with a tree. The fungus helps the tree to secure nutrients and water from the soil, more efficiently than the tree could do on its own. In turn, the tree provides the fungus with sugars that it made through photosynthesis high in the canopy, which the fungus is unable to make itself. Where does Indian Pipe fit in? While each member of the fungus-tree symbiosis returns something to the relationship, the Indian Pipe is parasitic – it takes, without giving anything in return. It parasitizes the fungus by fooling the fungus into thinking it’s another part of the tree. The fungus gives the Indian Pipe sugars, nutrients and water, but of course the Indian Pipe doesn’t give the fungus anything in return. It can get away with this because it saps a very small volume of food relative to what passes between the fungus and the tree, so neither of the symbiotic partners feels any sort of drain. I had seen many of these dried flower stalks in the forest on previous visits, but without any idea what they were. Now, having seen the Indian Pipe in the same area, I’m fairly certain that they’re last year’s Indian Pipe. 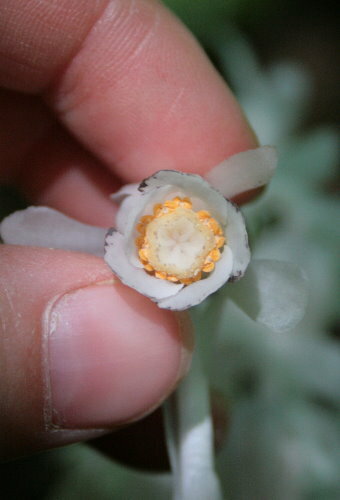 After the flowers are fertilized, as the fruits begin to mature, the stalk straightens so that they become erect and upright. 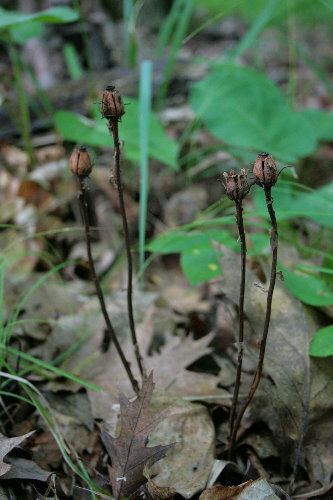 Eventually the plant material browns and dies, leaving woody, stiff stems topped with seed capsules. So what about that mention of blueberries at the beginning? 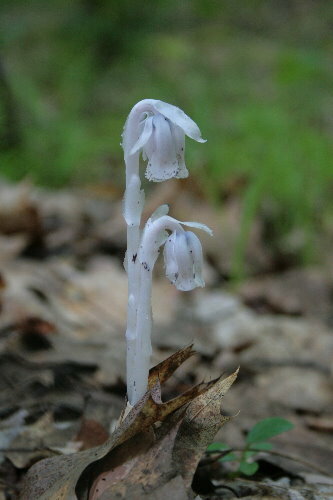 Indian Pipe is actually a member of the Ericaceae, the blueberry family, which includes blueberries and cranberries (of course), as well as rhododendron, azalea and arbutus, among others. Of the 3000+ non-photosynthetic plant species, the majority are in this family. The presence of Indian Pipe in a woodland usually means the soil is very rich and the forest extremely high-quality. If you spot the white flowers there, chances are there are many other unique and uncommon species to be found nearby. We always love encountering these pale, lovely plants. We had NO IDEA they were related to blueberries! Indeed, though one of our favorite sights, we never knew much about them. Thanks for such an informative post, Seabrooke! Wow, very cool. I’ve always wanted to see this plant in person but haven’t yet, so thanks for the vicarious experience. :) In Texas, where I sometimes live, we have several non-photosynthetic orchids of the genera Hexalectris and Corallorhiza. They, like the Indian Pipe, are obligate myco-heterotrophs. I remember camping as a youth in the provincial park north of my home. One day while hiding in the woods I found Indian Pipe growing. For some reason I was convinced that no one in the world had ever seen them before and that I had discovered a new plant, one without chlorophyl. I was tremendously disappointed to learn that they were in fact known to science. I also had no idea until now that they are related to blueberries. What an amazing world we live in. Great find, Seab! Thanks for the information. Enjoyed this post! I came across several clumps of Indian pipes while hiking recently. Did not know how cool they were in the sneaky department before reading your interesting info! Indian Pipes belonging to the same family as blueberries certainly is intriguing. I’m also surprised that they leave dried-out stems and seedpods — somehow I’d always expected them to moosh down to nothing, like toadstools. Very nice. I was out the same weekend with friends and we found lots of these as well. One of us stepped on one by mistake so we took the opportunity to disect it. When the pealed down the sides of the flower it was even more magnificent. I almost wrote a blog about the ones we saw but chose another topic instead. I glad you wrote yours and shared your photos. Keep up the good work. Very cool – I had not heard of this nor other non-photosynthetic plants. When I first saw the photos, I thought it might be a kind of mushroom. I’m going to keep an eye out for this plant the next time I hit the trails. I just got back from my annual summer holiday at my parents close to Seabrookes area, these pipes where everywhere this year, I had never seen before and googled stuff like white flower mushroom etc and came up with nothing, then i went under my favourites and picked marvelous in nature and voila, this popped up. This blog is amazing, Today i was thinking about how the whip o wills kept me up the first couple nights and thursdays post is about whip o wills, lol.